We have a serious problem with science journalism. A big one, in fact, and today that problem takes the form of a giant, prehistoric squid with tentacles so formidable that it has sucked the brains right out of staff writers’ heads. While making the rounds among a few California museums late last month, I kept hearing rumors of a bombastic, super-hyped presentation due to be presented at this year’s Geological Society of America meeting in Minneapolis. The scuttlebutt was that someone was going to give a talk about a super-intelligent, predatory squid which fed on huge ichthyosaurs during the Triassic. Fascinating, if true, but the reason that all the paleontologists I met were chuckling was because there was not a shred of actual evidence to back up the claims. Apparently, whoever was set to give the talk had apparently stayed up late watching It Came From Beneath the Sea too many times. Now the talk has officially been given and the scant details of the proposition have been oozed out into the newswires by way of a press release. Let me be clear — there is no paper yet or anything specific for those not in attendance at GSA to look at. This fact will be key to the media nonsense which has been swirling around the web today. You can find the skinny through ScienceDaily and the official GSA abstract, but the basic story is as follows. In central Nevada — among the roughly 215 million-year-old, Late Triassic rocks of what has come to be known as Berlin-Ichthyosaur State Park — paleontologists have previously found the remains of numerous marine reptiles called Shonisaurus popularis. These were some of the largest ichthyosaurs to have ever swum the ancient seas, and this particular site has been of interest to paleontologists because multiple individuals have been found together at some localities. Why these individuals were found together in a mass death assemblage is unknown — explanations have ranged from stranding to poisoning by a prehistoric red tide — but now Mark McMenamin and wife Dianna Schulte-McMenamin of Mount Holyoke College have suggested that the graveyard is actually a cache of bones collected and arranged by a squid the likes of which has never been seen. The proposed Triassic kraken, which could have been the most intelligent invertebrate ever, arranged the vertebral discs in biserial patterns, with individual pieces nesting in a fitted fashion as if they were part of a puzzle. The arranged vertebrae resemble the pattern of sucker discs on a cephalopod tentacle, with each amphicoelous vertebra strongly resembling a coleoid sucker. 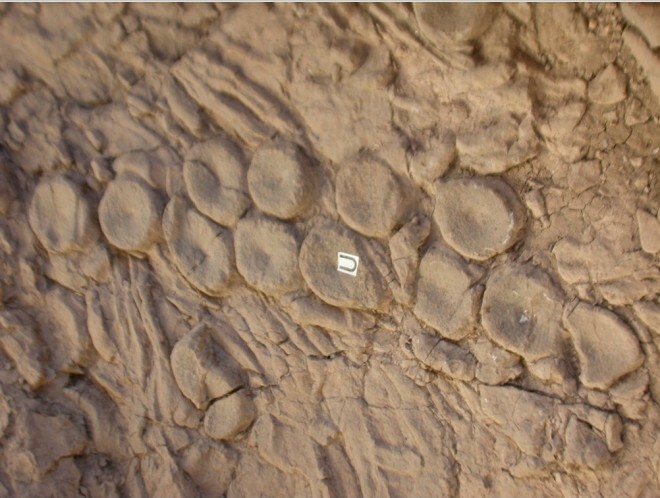 Thus the tessellated vertebral disc pavement may represent the earliest known self?portrait. Of course, the McMenamins were not the first people to ponder how the ichthyosaurs came to rest at the site. Paleontologist David Bottjer wrote a summary of the bonebed — largely based on the work of colleague Jennifer Hogler – for the book Exceptional Fossil Preservation. As a whole, the fossil deposits indicate that different Shonisaurus specimens died and became preserved in different ways. Some skeletons were scattered by currents and scavengers, and other, more-complete individuals — such as those at the Fossil House Quarry — were well preserved and found in multi-individual groups. In this latter case, a lack of encrusting invertebrates would seem to indicate that the skeletons came to be preserved in deep water environments with low levels of dissolved oxygen. The initial cause of death for the marine reptiles is unknown, but there is no good evidence that the exceptional sites were, to borrow from Ringo Starr, giant killer octopus gardens. Extraordinary claims require extraordinary evidence. Esteemed scientist and science communicator Carl Sagan reminded us of that throughout his career, but the message didn’t sink in at some newdesks. All you have to do is track the news of the “kraken” to see that recycling press releases often counts for “science news” right now. Jeanna Bryner of LiveScience swallowed the big squid story whole and had her version regurgitated at FOX and CBS News. Dean Praetorius of the Huffington Post, Houston Chronicle’s “Sci Guy” Eric Berger, and TG Daily’s Kate Taylor also took the bait. Who could resist a sensational, super-sized squid? Only Cyriaque Lamar of io9 sounded a minor note of skepticism — “But the possibility of finding that which is essentially a gargantuan mollusk’s macaroni illustration?”, Lamar wrote, “That’s the kind of glorious crazy you hope is reality.” Leave it to science bloggers like PZ Myers to point out how ridiculous this media feeding frenzy is. But what really kills me about this story is the fact that no reporter went to get a second opinion. Each and every story appears to be based directly off the press release and uses quotes directly from that document. No outside expert was contacted for another opinion in any of the stories — standard practice in science journalism — and, frankly, all the stories reek of churnalism. What does it say about the general quality of science reporting when major news sources are content to repackage sensationalist, evidence-lite speculations and print them without further thought or comment? Whether you think the “kraken” story should have been reported or ignored due to lack of evidence, the fact remains that journalists should have actually done their jobs rather than act as facilitators of hype. You don’t have to be a paleontologist to realize that there’s something fishy about claims that there was a giant, ichthyosaur-crunching squid when there is no body to be seen. Top Image: Shonisaurus vertebrae from Berlin-Ichthyosaur State Park. These bones are said by the McMenamins to be arranged in a pattern matching the tentacle pattern of a giant cephalopod, but I think that’s just pareidolia. From the GSA press release. Bottjer, D. “Berlin-Ichthyosaur: Preserving Some of the Earth’s Largest Marine Vertebrates” in Bottjer, D.; Etter, W.; Hagadorn, J.; and Tang, C. 2002. Exceptional Fossil Preservation: A Unique View on the Evolution of Marine Life. Columbia University Press: New York.